Polish cruiserweight Krzysztof Wlodarczyk cut and dropped Giacobbe Fragomeni in the fourth of an eventual seventh-round technical knockout over his familiar foe for the sixth defense of his WBC belt on Friday in Chicago. Referee Rocky Burke called a halt to the bout on the advice of a ringside doctor, who thought the cut beneach Fragomeni's eye was too severe. It was the rubber match for the European cruiserweight veterans. 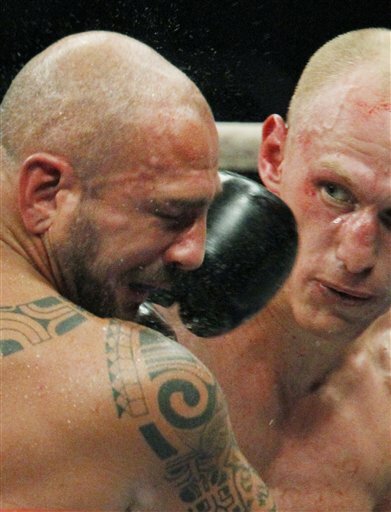 The fought to a draw in May 2009 and Wlodarczyk (49-2-1, 35 knockouts) stopped Fragomeni (31-4-2, 12 KOs) in the eightht round to win the vacant WBC title one year later. A 32-year-old from Warsaw, Wlodarczyk is 12-0-1 with eight stoppage wins since losing the IBF title to Steve Cunningham in 2007. In his previous fight in June, Wlodarczyk rose from a third-round knockdown and floored previously unbeaten 2008 Olympic gold medalist Rakhim Chakhkiev in the sixth, seventh and final stanzas of an eighth-round knockout victory. Fragomeni, 44, had gone 5-0-1, with two knockouts, since his last meeting with Wlodarczyk, and was coming off an eight-round unanimous decision over Toni Visic in July. In the co-feature, Chicago-based light heavyweight Andrzej Fonfara scored one knockdown during each of the first and final stanzas of Friday's second-round knockout over Samuel Miller before his partisan fans at UIC Pavillion in Chicago. In victory, Fonfara (25-2, 15 knockouts) improved to 15-0 with 12 stoppage wins since being knocked out, himself, in the second round by Derrick Findley in July of 2008. The knockout was the third straight for Fonfara, who floored Miller (26-8, 23 KOs) for good at the 58-second mark.